Artist's illustration showing the LISA Pathfinder spacecraft in space. A European space mission has achieved the closest thing to a true free fall ever observed for a human-created object, demonstrating the technology needed to build a future observatory that will hunt for gravitational waves far from Earth, scientists said. The two gold-platinum cubes inside the European Space Agency's (ESA) LISA Pathfinder spacecraft are virtually motionless with respect to each other, with a relative acceleration equivalent to the weight of a virus here on Earth, mission team members announced today (June 7). "Only by reducing and eliminating all other sources of disturbance could we observe the most perfect free fall ever created," added Danzmann, the co-principal investigator of the LISA Technology Package. "And this has shown us that we can build LISA, a space-based gravitational-wave observatory." Moving masses generate waves of gravitational radiation that stretch and squeeze space-time. See how gravitational waves work in this Space.com infographic. Gravitational waves are ripples in space-time that were first predicted by Albert Einstein's theory of general relativity a century ago. According to Einstein's equations, the acceleration of massive objects generates gravitational waves, which then propagate through the universe at the speed of light. Dramatic events such as black-hole mergers and supernova explosions produce the strongest gravitational waves. These ripples cause tiny distortions of space-time that should be identifiable, given a precise enough instrument. And in February, the first such direct detection was announced, by scientists with the Laser Interferometer Gravitational-Wave Observatory (LIGO) consortium, which operates huge detectors in Louisiana and Washington state. But ground-based instruments such as the LIGO detectors can spot only a subset of gravitational waves, because of interference from seismic activity and other factors here on Earth, ESA officials have said. Space-based observatories will therefore be needed to hunt for lower-frequency waves, such as those generated by mergers between the supermassive black holes that lurk at the hearts of galaxies, the officials added. ESA aims to launch such an observatory, provisionally known as LISA, in 2034. The mission will likely consist of three spacecraft arrayed in a triangle, with each leg about 620,000 miles (1 million kilometers) long. Inside each craft will be a "free-falling test mass"; lasers will measure the distance between these masses, spotting the minuscule anomalies caused by passing gravitational waves, researchers have said. Such work will require incredible precision, which means that the test masses will have to be in near-perfect free fall, unperturbed by sunlight pressure and other forces. And that's where LISA Pathfinder comes in. LISA (short for Laser Interferometer Space Antenna) Pathfinder — whose total cost to ESA is $490 million (430 million euros) — launched on Dec. 3, on a mission to demonstrate the technology required for the future observatory. At the heart of LISA Pathfinder are the two identical gold-platinum cubes, each of which weighs 4.3 lbs. (1.96 kilograms) and measures 1.8 inches (4.6 centimeters) on a side. The cubes are separated by 1.5 inches (3.8 cm), and they hang inside the spacecraft, which surrounds but does not touch them. A laser precisely measures the cubes' positions, orientations and distance from each other. "We can determine the distance of the two free-falling test masses to less than the diameter of a single atom," Gerhard Heinzel, leader of the Interferometry in Space research group at the Max Planck Institute for Gravitational Physics and Leibniz University in Hannover, said in the same statement. 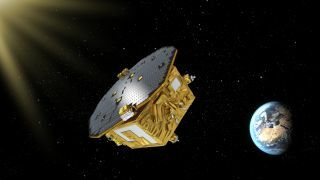 On Jan. 22, LISA Pathfinder reached its destination in space, a gravitationally stable spot known as Lagrange Point 1, which lies about 930,000 miles (1.5 million km) from Earth, in the sunward direction. Then, on March 1, the probe began its six-month science mission, performing a variety of experiments, including a crucial one that attempted to place the test masses in a virtually perfect free fall. LISA Pathfinder used its thrusters to maneuver precisely, shielding the masses from external forces — and did so incredibly effectively. Artist's impression showing the core of the LISA Pathfinder technology package, which consists of two gold-platinum cubes kept in close to a perfect free-fall state. The relative acceleration between the two test masses was lower than 1 part in 10 millionths of a billionth of Earth’s gravitational acceleration, mission team members said. This result — which is based on the first two months of data collection, and was published today in the journal Physical Review Letters — proves out the key technologies required to detect and study gravitational waves in space, Danzmann said. "At the precision reached by LISA Pathfinder, a full-scale gravitational-wave observatory in space like LISA would be able to detect fluctuations caused by the mergers of supermassive black holes in galaxies anywhere in the universe," he said. "The results reported by the LPF team are, quite simply, a tour de force in precision measurement," LIGO executive director David Reitze, who's based at the California Institute of Technology in Pasadena, wrote in an accompanying "Viewpoints" piece that Physical Review Letters also published today. "These results bode extremely well for the future LISA mission," added Reitze, who was not involved in the LISA Pathfinder (LPF) study. "The LPF experiments firmly establish that the precision needed by LISA for measuring test-mass displacements are well in hand, setting the stage for the next era in gravitational-wave detectors."